APATZINGAN, Mexico — Busloads of teenagers descend on this sweltering agricultural town 500 kilometres west of Mexico City every few months to participate in self-improvement seminars. The seminars supposedly impart values, build self-esteem and condemn vices such as drug use, according to Father Andres Larios, a Catholic priest working with young people in Apatzingan. Unbeknownst to the participants, a quasi-religious drug cartel known as La Familia Michoacana promotes the seminars and underwrites the expenses. The seminars highlight the acts of charity and piety attributed to La Familia, a cartel notorious for running extortion rackets, corrupting politicians and police forces throughout the western state of Michoacan and manufacturing tons of methamphetamines in clandestine laboratories. Its leaders reputedly pave roads and pay hospital bills in impoverished pueblos, talk up law and order and even preach a homespun version of the gospel from a text authored by a cartel capo that goes by the handle El Mas Loco, or The Craziest One. “These people carry a Bible in the right hand . . . and a gun in the left hand,” Larios says. Displays of religiosity are nothing new for Mexico’s narcotics kingpins; it’s alleged they have donated big to the Catholic Church – a charged denied by church officials – and adore Jesus Malverde, a Robin Hood-like figure they claim as their patron saint. But by developing its own pseudo religion and base of social support in long-neglected corners of Mexico, La Familia has emerged as an enigmatic foe – and the most prominent target of late – in the Mexican government’s crackdown on drug cartels. So far this year, La Familia has withstood the arrests of more than 100 leaders, the destitution of at least 10 mayors in Michoacan with alleged cartel ties and the closure of more than 40 methamphetamine labs. The Mexican government was forced to call in reinforcements in mid-July after the cartel launched co-ordinated counterattacks on Federal Police installations in retaliation for the arrest of a senior leader. 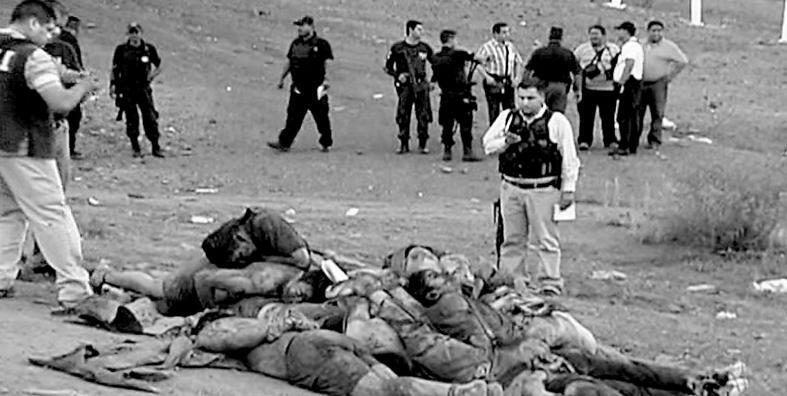 A column by Ciro Gomez Leyva prompted uncomfortable questions about the effectiveness of the government crackdown, which has claimed more than 11,000 lives since President Felipe Calderon took office in December 2006. His comments reflected the supposed religiosity of La Familia, but also rallied the cartel’s base in Michoacan. The state unfolds across Western Mexico and is known for outward migration, a hard-luck countryside and a decades-old drug trade in the mountainous regions that hug an isolated stretch of coastline stretching from Zihuatanejo toward Manzanillo. Out-of-state-cartels long dominated the Michoacan drug trade, but that ended in late 2006 with the emergence of La Familia, which announced its formation by tossing six heads into a seedy nightclub. La Familia also purchased newspaper ads that promised to “impose order in the state” and “fight the out-of-control-violence” that it blamed on Los Zetas, the armed wing of the rival Gulf Cartel and former La Familia partners. Larios says that La Familia further showed its nativism by imposing a locals-only hiring policy and buying cash crops – mainly marijuana – from poor farmers. The magazine Proceso reported that La Familia pays its employees salaries of $2,000 per month – a fortune in a country with a minimum wage of just $5 per day. The cartel slips even more money to politicians and local police departments. La Familia is suspected of corrupting many of Michoacan’s 113 municipal governments and local police forces; an arrest warrant has been issued for the state governor’s brother, Julio Cesar Godoy – who was just elected to Congress – for supposed links to the cartel. La Familia plies its members with more than just money, however. “The peculiar thing about them is the name: La Familia,” said security expert Javier Oliva of the National Autonomous University of Mexico. Some cartels hire drug addicts, Oliva says, and sometimes pay underlings with merchandise. In comparison, La Familia has recruited out of a drug rehabilitation program it operated, according to the Public Security Secretariat. The cartel forbids employee drug consumption and subjects personnel to “training” that involves reading the cartel’s bible, a text that borrows from the Old Testament, pop-psychology books and Mexican truisms. “It’s better to die fighting head-on than on your knees,” reads one passage that invokes Mexican revolutionary Emiliano Zapata. “I ask God for strength and he gives me difficulties that strengthen me,” reads another. Larios insists that La Familia leaders belong to an unknown evangelical sect, although some attend Catholic events such as baptisms and quinceaneras. The Federal Police have started targeting such celebrations in their pursuit of La Familia leaders, but Larios says the execution of an August raid during mass in an Apatzingan parish revealed shortcomings in the ongoing federal campaign against the cartel – along with a lack of intelligence and popular support in the region. When coming to arrest Miguel Angel Beraza, also known as La Troca – a La Familia leader accused of running tractor-trailer loads of methamphetamines to the United States – the Federal Police didn’t know the way.